Update: Comments point out that the instructions here may be dangerous. Consider using the Visual C++ 2008 Express edition or the purpose-built Microsoft Visual C++ Compiler for Python (details) and NOT using the original answer below. Original error message means the required version of Visual C++ is not installed. While running setup.py for package installations, Python 2.7 searches for an installed Visual Studio 2008. You can trick Python to use a newer Visual Studio by setting the correct path in VS90COMNTOOLS environment variable before calling setup.py. WARNING: As noted below, this answer is unlikely to work if you are trying to compile python modules. See Building lxml for Python 2.7 on Windows for details. I found the solution. I had the exact same problem, and error, installing 'amara'. I had mingw32 installed, but distutils needed to be configured. I have Python 2.6 that was already installed. Make sure environment is set by opening a new cmd.exe. Run python.exe to display which version of VC++ it was compiled with (example shown below). It is important to use the corresponding version of the Visual C++ compiler that Python was compiled with since distilutils's get_build_version prevents mixing versions (per Piotr's warning). Download and install the corresponding version of Visual Studio C++ from the previous step. Additional notes for specific versions of VC++ are listed below. For only the 32-bit compilers, download Visual Studio C++ 2008 Express Edition. For the 64-bit compilers, download Windows SDK for Windows 7 and .NET Framework 3.5 SP1. Uncheck everything except Developer Tools >> Visual C++ Compilers to save time and disk space from installing SDK tools you otherwise don't need. According to Microsoft, if you installed Visual Studio 2010 SP1, it may have removed the compilers and libraries for VC++. If that is the case, download Visual C++ 2010 SP1 Compiler Update. 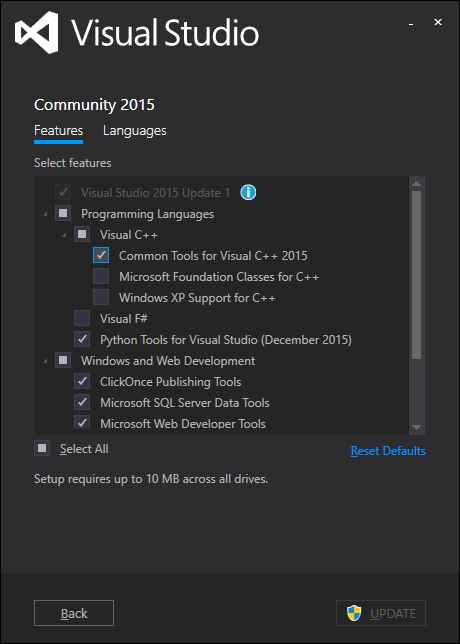 If you don't need the Visual Studio IDE, download Visual Studio C++ 2015 Build Tools. If you don't need the Visual Studio IDE, download Build Tools for Visual Studio 2017. Suggestion: If you have both a 32- and 64-bit Python installation, you may also want to use virtualenv to create separate Python environments so you can use one or the other at a time without messing with your path to choose which Python version to use. According to @srodriguex, you may be able to skip manually loading the batch file (Steps 4-6) by instead copying a few batch files to where Python is searching by following this answer. If that doesn't work, here are the following steps that originally worked for me. Before you try installing something which requires C extensions, run the following batch file to load the VC++ compiler's environment into the session (i.e. environment variables, the path to the compiler, etc). Note: Yes, the native 64-bit compilers are in Program Files (x86). Don't ask me why. Additionally, if you are wondering what the difference between vcvars64.bat and vcvarsx86_amd64.bat or more importantly the difference between amd64 and x86_amd64, the former are for the native 64-bit compiler tools and the latter are the 64-bit cross compilers that can run on a 32-bit Windows installation. If for some reason you are getting error: ... was unexpected at this time. where the ... is some series of characters, then you need to check that you path variable does not have any extraneous characters like extra quotations or stray characters. The batch file is not going to be able to update your session path if it can't make sense of it in the first place. Hope and cross your fingers that the planets are aligned correctly for VC++ to cooperate. What's going on? Python modules can be part written in C or C++ (typically for speed). If you try to install such a package with Pip (or setup.py), it has to compile that C/C++ from source. Out the box, Pip will brazenly assume you the compiler Microsoft Visual C++ installed. If you don't have it, you'll see this cryptic error message "Error: Unable to find vcvarsall.bat". If you too think "Error: Unable to find vcvarsall.bat" is a ludicrously cryptic and unhelpful message, then please comment on the bug at http://bugs.python.org/issue2943 to replace it with a more helpful and user-friendly message. You'll need to install a Microsoft compiler, compatible with the compiler used to build Python. This means you need Visual C++ 2008 (or newer, with some tweaking). This is a relatively small package; 85MB to download, installable without admin privileges, no reboot required. The name is a little misleading, the compiler will work for any Python version originally compiled with Visual C++ 2008, not just Python 2.7. If you start a Python interactive prompt or print sys.version, look for the MSC version string; if it is MSC v.1500 you can use this tool. This package contains all the tools and headers required to build C extension modules for Python 2.7 32-bit and 64-bit (note that some extension modules require 3rd party dependencies such as OpenSSL or libxml2 that are not included). Other versions of Python built with Visual C++ 2008 are also supported, so "Python 2.7" is just advertising - it'll work fine with 2.6 and 3.2. Note that you need to have setuptools 6.0 or newer installed (listed in the system requirements on the download page). The project you are installing must use setuptools.setup(), not distutils or the auto-detection won't work. Microsoft has stated that they want to keep the URL stable, so that automated scripts can reference it easily. I have mingw (g++ (GCC) 4.6.1) and python 2.7.3 in a windows 7 box and I'm trying to install PyCrypto. Now, I can finally start working. Look in the setup.py file of the package you are trying to install. If it is an older package it may be importing distutils.core.setup() rather than setuptools.setup(). Trying to do python setup.py build rather than using pip. If you use a recent version of pip, it will force (monkeypatch) the package to use setuptools, even if its setup.py calls for distutils. However, if you are not using pip, and instead are just doing python setup.py build, the build process will use distutils.core.setup(), which does not know about the compiler install location. Open the Start menu or Start screen, and search for "Visual C++ 2008 32-bit Command Prompt" (if your python is 32-bit) or "Visual C++ 2008 64-bit Command Prompt" (if your python is 64-bit). Run it. The command prompt should say Visual C++ 2008 ... in the title bar. Set these environment variables in the command prompt you just opened. cd to the package you want to build, and run python setup.py build, then python setup.py install. If you want to install in to a virtualenv, activate it before you build. It took very long - several minutes for numpy to compile, I even thought that there was an error, but finally everything was ok.
Set environment variable VS90COMNTOOLS to the installation path of Visual C++ for Python 2.7 (see above path). the file msvc9compiler.py. Find in it the function find_vcvarsall and do following modification. This is where vcvarsall.bat resides in my case (check, where vcvarsall.bat is in your installation). I encountered this issue when I tried to install numpy library on my python 3.5. The solution is to install VS2015. I had VS2008, 2012, 2013, none of which is compatible with python 3.5. Apparently newer version of python has dependency on newer versions of VS.
Also make sure C++ Common Tools are installed with Visual Studio. I tried all the above answers, and found all of them not to work, this was perhaps I was using Windows 8 and had installed Visual Studio 2012. In this case, this is what you do. Simply select the file, and copy it. and paste the file. And then, all should be well. You can download the free Visual C++ 2008 Express Edition from http://go.microsoft.com/?linkid=7729279, which will set the VS90COMNTOOLS environment variable during installation and therefore build with a compatible compiler. I had this problem using Python 3.4.1 on Windows 7 x64, and unfortunately the packages I needed didn't have suitable exe or wheels that I could use. This system requires a few 'workarounds', which are detailed below (and TLDR at bottom). Using the info in Jaxrtech's answer above, I determined I needed Visual Studio C++ 2010 (sys.version return MSC v.1600), so I installed Visual C++ 2010 Express from the link in his answer, which is http://go.microsoft.com/?linkid=9709949. I installed everything with updates, but as you can read below, this was a mistake. Only the original version of Express should be installed at this time (no updated anything). This would not install for me though, and the installer returned the error installation failed with return code 5100. I found the solution at the following link: http://support.microsoft.com/kb/2717426. In short, if newer versions of x86 and x64 Microsoft Visual C++ 2010 Redistributable's are installed, they conflict with the ones in SDK installer, and need uninstalling first. The SDK then installed, but I noticed vcvars64.bat still did not exist in C:\Program Files (x86)\Microsoft Visual Studio 10.0\VC\bin, nor its subfolders. vcvarsall.bat runs the vcvars64 batch file, so without it, the python package still wouldn't install (I forgot the error that was shown at this time). I then found some instructions here: http://www.cryptohaze.com/wiki/index.php/Windows_7_Build_Setup#Download_VS_2010_and_Windows_SDK_7.1 Following the instructions, I had already installed Express and 7.1 SDK, so installed SDK 7.1 SP1, and did the missing header file fix. I then manually created vcvars64.bat with the content CALL setenv /x64. I will paste all those instructions here, so they don't get lost. Step 1 is to download Visual Studio Express 2010.
http://www.microsoft.com/visualstudio/en-us/products/2010-editions/express is a good place to start. Download the installer, and run it (vc_web.exe). You don't need the SQL 2008 additional download. http://www.microsoft.com/en-us/download/details.aspx?id=8279 is a good starting point to download this - you'll want to run winsdk_web.exe when downloaded! The default install here is just fine. And, bloody hell, fix the missing batch file for VS2010 Express. This is getting downright absurd. This runs a batch job that appears to set up a working environment for the compiler. From that prompt, you can type "setup.py build" or "setup.py install". I opened the Windows SDK 7.1 Command Prompt as instructed, and used it to run easy_install on the python package. And at last, success! Install Visual Studio Express 2010 (preferably without updated redistributables or SQL server). Instal SDK 7.1 SP1 update, and VS2010 SP1 header file fix (this step may not be required). Start->All Programs->Microsoft Windows SDK v7.1 ->Windows SDK 7.1 Command Prompt to open special x64 command prompt, which can then be used with python/easy_install/pip/etc (including those in virtual_envs). I tried many solutions but only one worked for me, the install of Microsoft Visual Studio 2008 Express C++. I got this issue with a Python 2.7 module written in C (yEnc, which has other issues with MS VS). Note that Python 2.7 is built with MS VS 2008 version, not 2010! Despite the fact it's free, it is quite hard to find since MS is promoting VS 2010. Still, the MSDN official very direct links are still working: check https://stackoverflow.com/a/15319069/2227298 for download links. works, forcing pip to build using the mingw compiler instead of Microsoft's. See here https://github.com/pypa/pip/issues/18 for details (last post). Is Microsoft Visual C++ Compiler for Python 2.7 at http://www.microsoft.com/en-us/download/details.aspx?id=44266 not a solution? Below steps fixed this issue for me, I was trying to create setup with cython extension. The default install location would be @ C:\Users\PC-user\AppData\Local\Programs\Common\Microsoft\Visual C++ for Python This might actually fix the issue, test once before proceeding. Open the msvc9compiler.py file of distutils package in notepad. The above steps fixed the issue for me. I got the same problem and have solved it at the moment. "Google" told me that I need to install "Microsoft Visual C++ Compiler for Python 2.7". I install not only the tool, but also Visual C++ 2008 Reditributable, but it didn't help. I then tried to install Visual C++ 2008 Express Edition. And the problem has gone! Just try to install Visual C++ 2008 Express Edition! If you're looking to install pyodbc on a Windows box that doesn't have Visual Studio installed another option is to manually install pyodbc using the binary distribution. This is particularly useful if you do not have administrator privileges on the machine you're working with and are trying to set up a virtualenv. With Python 3.4, the dependency is on Visual Studio 2010. Installing Visual C++ 2010 Express fixed the problem for me. Tricking it into using the VS 2008 or 2013 installs that I happened to have didn't work. You can use easy_install instead of pip it works for me. The answer given by @monkey is one of the correct ones, but it is incomplete. In case you'd like to use MinGW, you should select the C, C++ and also other development tools suggested during the MinGW installation process to also get "make.exe." You must also have the path set to make.exe in the env. Make sure the environment variables is set by opening a new cmd.exe. I had the same error (which I find silly and not really helpful whatsoever as error messages go) and continued having problems, despite having a C compiler available. Surprising, what ended up working for me was simply upgrading pip and setuptools to the most recent version. Hope this helps someone else out there. If you have python 3.4.x, the solution is simply to install VC++ 2010 since it is used to compile itself into. Not the answer you're looking for? Browse other questions tagged python windows pip setup.py failed-installation or ask your own question.